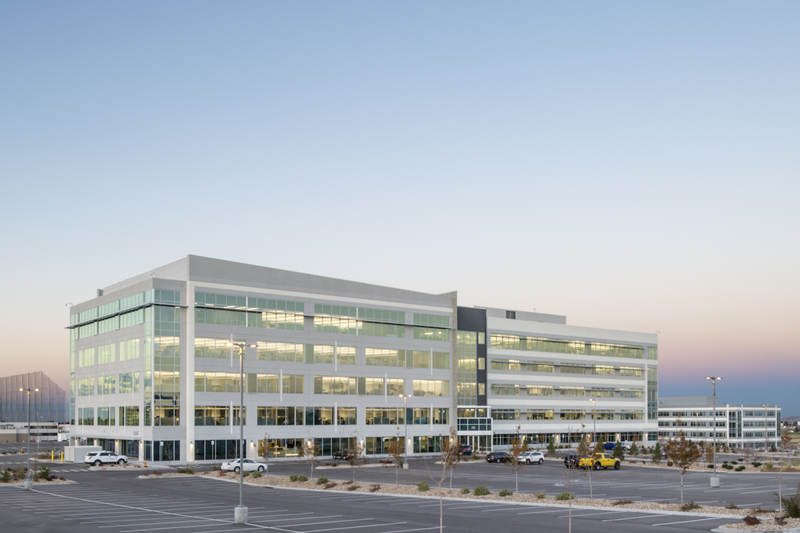 The approach to the floorplate configuration of this five-story 222,000 square foot speculative office building is the generator of its architectural strategy. 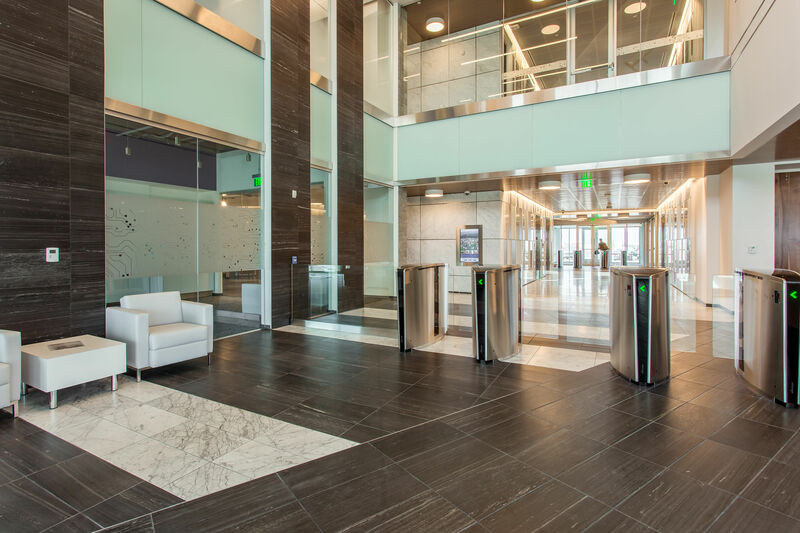 The floor plate is set up as two “pods” of 20,000 square feet connected by a 35’ foot wide bay which accommodates the lobby on the first and second floors and facilitates a flow around fully connected leasing configuration on the upper levels. 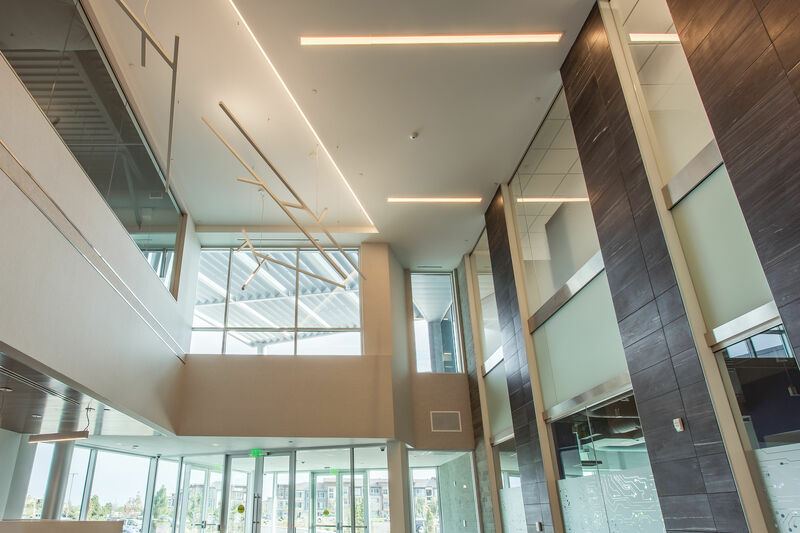 This approach allows for optimized market responsive lease bays with a range of single bay tenants , half floor tenants and full floor tenants without any compromises. Architecturally, the pods are slipped about this central connecting bay ameliorating the bulk and mass of the building volume as a large block. Instead it appears to be two individual but connected buildings, very much like what finds in an urban street wall. The exterior elevations respond to this approach with coordinated but differentiated compositions. On approach to the main façade, the left “building has a running bond organization of the fenestration pattern, set off on the extreme left by a strong and fully glazed corner expression and on the entry bay side towards the middle a stone clad vertical fin. 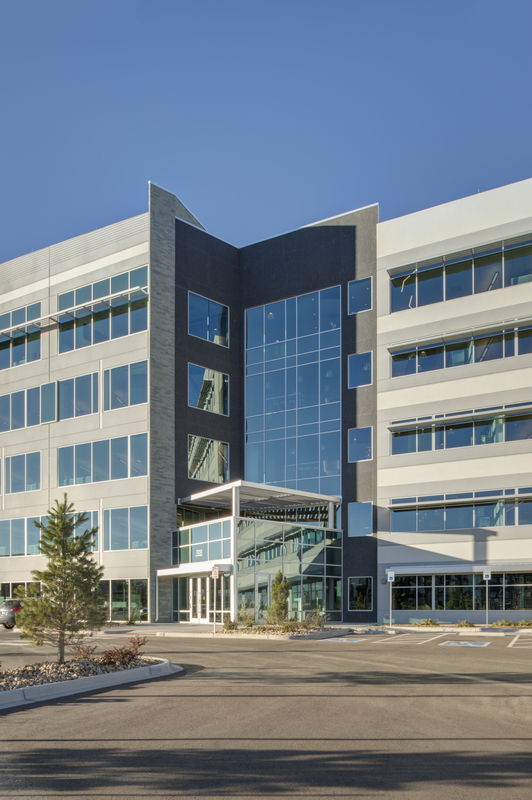 The top floor takes advantage of the buildings uniquely employed tilt wall construction method to achieve a 55 foot long un-interrupted glass line which exceeds Class A standards for a best in class feature. The right side “building” is set back 15 feet from the left building façade and is a subtle simplified and thus “secondary” rendition of the left. 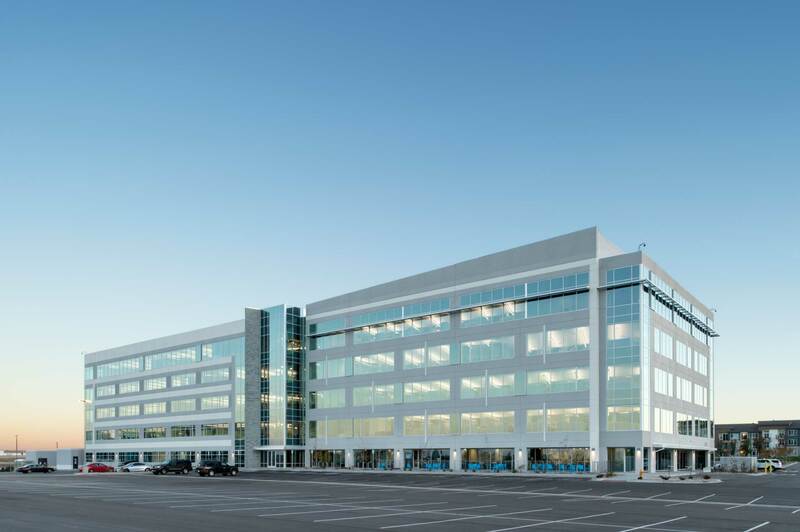 It is set up in a regular gridded expression of the buildings normal 25’ bay to bay glass line, with form liner details in the concrete and topped with the same long bay glass line as the left building providing a compositional balance / continuity. 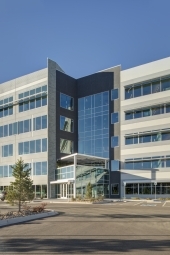 The center bay makes clear through its advanced curtain wall expression that it is the entry. 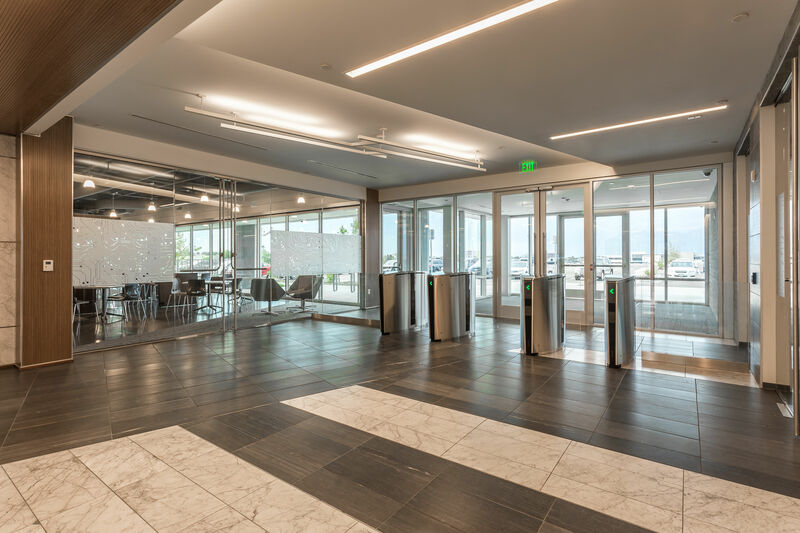 An inventive approach to lobby vestibule that accommodates a second floor balcony amenity, also facilitates the canopy at the entry to establish a comfortable scale for visitor and a functional level of snow and rain protection. The overall sense of presence the building conveys is well scaled and balanced in spite of the market driven floorplates sizes which could be, handled differently, overwhelming. The building has accommodated the need to be general without succumbing to being neutral. The project is LEED Silver Certified.